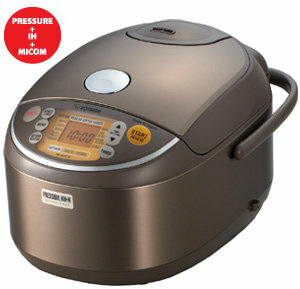 The NP-NVC18 10-cup Induction Heating Pressure Rice Cooker and Warmer is the most intelligent rice cooker ever made. Advanced fuzzy logic technology with AI (Artificial Intelligence) "learns" and adjusts the cooking cycle to get perfect results every time. This rice cooker will automatically select from 3 pressure settings according to the menu selected for the best cooking results. 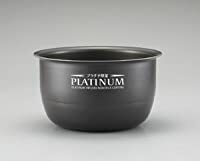 The platinum infused nonstick inner cooking pan changes the water quality and allows rice to absorb water easily for better tasting rice. NP-NVC18 also includes superior induction heating technology, multi menu cooking functions with healthy brown rice and GABA brown rice cooking options, Zojirushi's exclusive Umami setting, scorch setting, and steam reduce setting, an easy-to-read colored LCD control panel with clock and timer functions, a delay timer with two settings, an interchangeable melody and beep signal to indicate the end of the cooking cycle, automatic keep warm as well as extended keep warm, and a detachable and washable stainless-steel inner lid. For safety, the appliance provides a pressure-control valve, a back-up safety valve, an inner lid filter, and a pressure indicator on the control panel, which locks the lid during pressure-cooking. Easy to clean clear coated stainless steel exterior and washable detachable inner lid makes clean up a snap. Accessories include a rice spatula, a spatula holder, and two measuring cups (for regular rice and rinse-free rice). The ETL-approved 1,370-watt rice cooker and warmer measures 11-1/8 by 16-1/2 by 10-1/8 inches. Because sushi rice will be processed after it's cooked, it's easier to handle when it is a little firmer. This menu setting is very similar to regular white rice, but uses less water (adjusted by the water fill lines) for a firm finish. A newly discovered way of cooking brown rice to "activate" it and increase natural occurring gamma-aminobutyric acid (GABA), an amino acid in brown rice believed to have health giving properties such as lowering blood pressure, improving kidney function and relieving stress. The brown rice is "activated" by soaking it at 104 degrees F for 2 hours before the actual cooking begins. All Zojirushi Induction Heating System rice cookers, including the IH Pressure models, have the GABA brown rice setting. Not to be confused with Germinated Brown Rice: Germinated brown rice is a type of brown rice that has been processed. It is a type of rice that must be purchased. The process gives it a softer texture and improved taste. It also contains increased values of GABA. Germinated brown rice, sometimes also called sprouted brown rice, may be cooked using the "Softer" menu in most Zojirushi rice cookers. 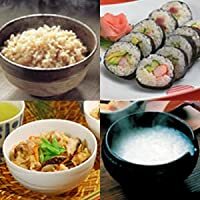 The AI (Artificial Intelligence) allows the rice cooker to "learn" from past cooking experiences and adjust the cooking "flow" to cook ideal rice. NP-NVC18 cooks rice to the same consistency in summer or winter, when water and room temperatures may be drastically different. 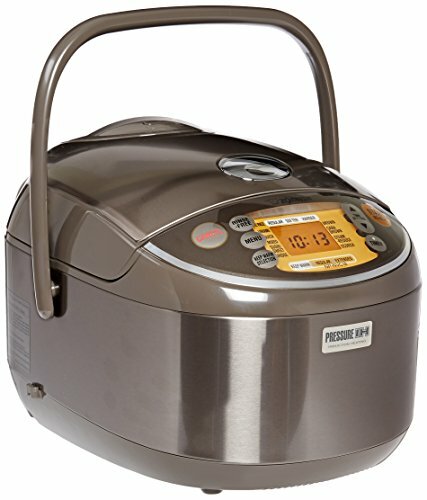 Even after years of use, the rice cooker can cook rice to the same consistency as when the unit was new. With AI technology, the rice cooker remembers the capacity you cook most often, and selects the ideal cooking "flow" from the very first stage of the cooking process. Basically, the microchip does all the thinking for you to adjust cooking times and temperatures, sets the precise amount of pre-soaking time of the raw grains, and the time for the final "wait" period during steaming. Conventional rice cookers simply turn on and off in reaction to temperature. Fuzzy Logic Technology fine tunes this adjustment to adapt to various rice types, such as white, brown, sweet or porridge, which all have different cooking requirements. This model has separate thermometers that monitor the room temperature, the temperature inside the unit, and the temperature of the inner cooking pan to collect data to aid in the cooking and keep warm process. Induction Heating took rice cooking to another level by literally introducing another dimension to the heating process. Where the heating element would normally be located at the bottom of the cooker, IH transforms the entire inner cooking pan into a heat conductor, allowing for higher, more precise and more uniform cooking temperatures. Pressure cooking is a method of cooking in a sealed vessel that does not permit air or liquids to escape below a preset pressure resulting in even higher temperatures. Cooking rice with pressure is a better way to turn beta starch into alpha starch, which makes the rice softer and easier to digest. (The starch in grains is beta starch. Raw rice is hard because beta-starch is rigid. Beta-starch resists digestion by any enzyme, to protect the seed from germinating when conditions are unfavorable. When rice is cooked, the starch loses its rigidity, and turns into a soft pasty alpha-starch.) This change makes the rice softer and easier to digest, and even fluffier to the taste. Rice cooked with pressure has also been found to stay soft for longer periods of time when compared to regular cooked rice. A specially designed lid keeps the cooker airtight and sealed, which prevents the steam from escaping. 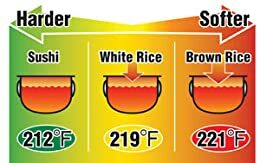 As pressure builds inside while the rice cooks, the boiling point of the water increases beyond the normal 212 degrees F. Once the water is allowed to boil, it cannot be heated further; but inside a sealed environment under pressure, higher temperatures can be reached, which penetrates everything in the cooker from the surface of the food to its center. The unit automatically selects from three pressure levels according to the menu selected. Three pressure settings are available to steam the rice to varying degrees of firmness; lower pressure and temperature for firmer rice, and higher pressure and heat for softer rice. Zojirushi has multiple safety features for a rice cooking experience that is as safe as possible. The nonstick coating on the inner cooking pan is infused with platinum particles. Through research, we discovered that platinum alkalizes water. Alkaline water breaks down the protein on the surface of the rice grain, and water is able to penetrate the rice grain more easily. Enhanced gelatinization brings out the sweetness of rice ultimately making better tasting rice. The platinum particles are burnt onto ceramic particles, which are mixed into the nonstick coating. The water is alkalized when poured into the inner cooking pan and comes into contact with the platinum particles. The Umami setting soaks the rice before cooking longer than the regular white setting. During this extended soaking time, the sugar contained within the rice is slowly released out into the water. Once the rice cooker begins to cook the rice, the sugar that was released into the water reattaches itself onto the surface of the rice, making the cooked rice taste sweeter. The Umami setting also extends the steaming time at the end of the cooking cycle. The Steam-Reduce setting reduces steam to 50% of the Regular Setting. The Rinse-Free setting can be used together with Steam-Reduce, but it is a separate course from other courses, and cannot be combined (e.g., you cannot cook choose Steam-Reduce when cooking sweet or mixed rice). The rice texture may be slightly harder than Regular. The Scorched setting lightly toasts the bottom of the rice for a crispy texture. This is also a separate setting, and cannot be combined with other settings. It is recommended that the rice be consumed immediately. Extended Keep Warm keeps cooked rice warm at a lower temperature than Regular Keep Warm to minimize drying and yellowing of rice. It is ideal to switch to Extended Keep Warm when keeping rice warm for a longer period of time. The rice cooker will switch to Regular Keep Warm automatically for 24 hours after cooking completion. The reheat function will raise the temperature of the rice closer to immediately after cooking. Reheating will take about 5-8 minutes. It can be used to reheat rice kept warm under Regular or Extended Keep Warm, to bring the temperature closer to immediately after cooking. The lid sensor detects how many times the lid has been opened and for how long, and calculates the amount of rice left inside the inner cooking pan. The rice cooker calculates how much heat is needed to keep the rice at the ideal keep warm temperature. The keep warm monitor alerts you by beeping four times, 10, 40 or 70 minutes after cooking completes if the lid has not been opened, to encourage you to fluff the rice to release excessive moisture. The rice cooker will also beep four times if the lid is left open for over 5 minutes to remind you to close the lid. If unclosed, the rice cooker will beep every 3 minutes thereafter for up to 3 times. Both beeps will not sound if the rice cooker is set to "Silent" mode. Easy-to-read LCD control panel with clock and timer features. Menu Settings include: white (regular,softer, harder), umam, mixed, sushi/sweet, porridge, brown, GABA brown, steam-reduced, scorch, rinse-free and quick cooking.